Welcome to Issue 15 of Waiting for, in which we return to our regularly scheduled Wednesday time slot. Lots of new and exciting out this week, but first a brief rant. Due to shipping problems with Diamond, my LCS is still waiting on books that were due in stores a month ago. One. Month. Ago. And that's just not acceptable, in my opinion. My LCS is doing its darnedest to stay in business and compete in this economy, and Diamond is doing its best to, well...to go directly against that. First up, we have a book from DC Comics, by two creators that are familiar to all comics fans. 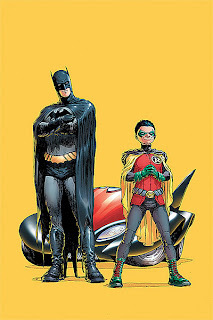 Written by Mad Scientist Grant Morrison and drawn by the great Frank Quitely, Batman and Robin, issue 1 hits today. I'm really looking forward to this book, for a couple of reasons. First, Morrison and Quitely on anything is going to be good. Second, in interviews Morrison has stated that this title will feel more like his and Quitely's All Star Superman than (the Frank Miller/Jim Lee) All Star Batman and Robin. And, while I don't mind All Star Bats, I know that many fans aren't big on that book. Which, by the way, hasn't shipped in...um...I don't even know how long it's been. Anyway, Morrison's Batman and Robin will likely be a zany, fun look at a Batman that mixes classical and current Dark Knight mythos, and I'm definitely up for that. "Batman Reborn" begins here! With the reunited team of Grant Morrison and Frank Quitely (ALL-STAR SUPERMAN, WE3, New X-Men), this first issue kicks off a 3-part story arc that can't be missed! The new Dynamic Duo hit the streets with a bang in their new flying Batmobile as they face off against an assemblage of villains called the Circus of Strange. They also tackle their first mission investigating a child who's been abducted by the mysterious Domino Killer. But will everything go smoothly? And who exactly are the new Batman and Robin? The newest era of The Dark Knight begins here! Now, just a note that this book is highly anticipated, and will likely sell out quickly, so be sure to get to your shop early, or call ahead and reserve the book. Next up we have one of those titles that my comics shop didn't get the last issue of. (Does that sentence even make sense?) Mark Waid's super hero deconstruction, Irredeemable, issue three ships today, and I still haven't read issue two because of the aforementioned shipping problem. Still, issue one was so good, that I am really looking forward to reading issues two and three. If you've checked the series out, then I'm sure you'll be picking this up today. And if you haven't, do give it a shot because it's certainly worth your effort. A comic book industry event: a new original ongoing superhero series from Mark Waid! IRREDEEMABLE dares to ask the question: what if the world's greatest hero decided to become the world's greatest villain? Does Plutonion’s past hold the key to his current deadly rampage? Or does it even matter? A "twilight of the superheroes"-style story that examines super-villains from the writer of KINGDOM COME and EMPIRE! Next is more of a head's up than a recommendation, mostly because it's for a book that I have yet to read. And, by "book," I mean, like one without the pictures. 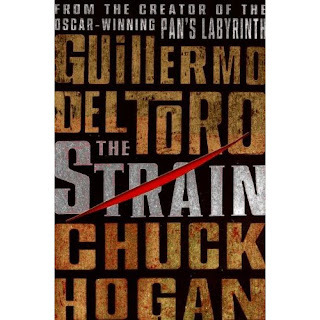 Written by Guillermo del Toro (director of the Hellboy movies and Pan's Labyrinth) and Chuck Hogan, The Strain hit bookstores yesterday. And finally, a recommendation that has nothing at all to do with comics. Yesterday was the release date of the long-awaited new album by the Dave Matthews Band, and I happily bought a copy first chance I got. Titled Big Whiskey & the GrooGrux King, this is the first album the band's released in five years, and the first since the tragic death of saxophonist LeRoi Moore. The band's been all over promoting this album, and it's certainly apparent that the effort was an emotional one for all of the band members. What came from these efforts, however, is arguably the best album DMB has released--a point that's becoming agreed upon by fans and music critics alike. If you're a DMB fan, then you already have the album, but if you're looking to get into DMB but just never bothered, now's a great time to start. Anyway, that's all for today. What are you Waiting for?